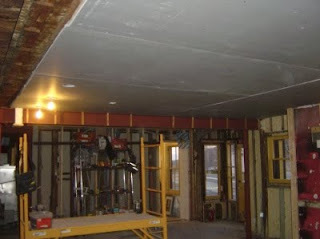 We got a few more sheets of drywall up on the ceiling, though there was more cutting and fitting this time. We're starting to hit the areas, which require a bit more preparation (I still have a little bit of framing to do, and run more wires before we can close some of the walls, but it'll happen, don't worry). Ah! Finally a moment to catch up. Seems like you had a busy week. Agreed, installing phone lines doesn't sound very exciting but it must have felt great when it was done. I love the play house, what a great idea. We are gearing up for a walk in the snow so maybe we'll comment on the rest of the progress in person.